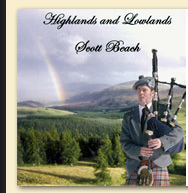 SCOTTISH-TRAINED BAGPIPER SCOTT BEACH'S FIRST INDEPENDENTLY PRODUCED SD, HIGHLANDS AND LOWLANDS, REPRESENTS A PIPER'S LIFELONG LOVE OF CELTIC MUSIC. FOR OVER 25 YEARS SCOTT HAS BEEN PERFORMING NO THE BAGPIPES, SELECTIVELY COMPILING THE VERY BEST OF SCOTTISH AND IRISH MUSIC FOR YOU TO ENJOY. PERFORMING ON MORE THAN FOUR DIFFERENT SOUNDING BAGPIPES, SCOTT WILL TAKE YOU ON A MUSICAL JOURNEY ACROSS THE RUGGED HIGHLANDS, INTO THE BEAUTY OF LOWLAND SCOTLAND, AND BEYOND THE WINDSWEPT GAELIC ISLES TO THE SHORES OF IRELAND. HIGHLANDS AND LOWLANDS IS SURE TO PUT A STIR IN YOUR SOUL AND A LILT IN YOUR STEP. "Your CD is fantastic, I've never heard a bagpipe CD that was so diverse and interesting. Great selection of tunes, both old and new." Robert P.